A pop-up camper is a great halfway point between tent camping and RV camping that offers many of the features of RV camping, but still gives you the rustic, simple, and natural feel of sleeping under the stars. 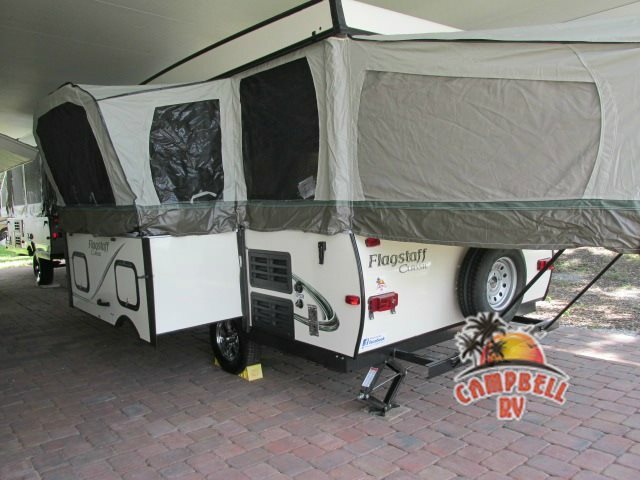 If you are considering a folding pop-up camper, check out some of the awesome benefits that come along with getting a pop-up like those we carry here at Campbell RV. Price – The major stand-out feature is the price. While RVs come in a wide range of prices, you can get a brand-new pop up for as little as $14,000 or less depending on the model and features that you want in the pop-up. And, with the savings that we offer here, you can get one for much less! Ease of Use – When you take the pop-up out, the entire thing can be expanded, set up, and be ready to relax in a matter of minutes. That means that you get to spend less time worrying about setting up jacks and getting a large enough level spot and more time enjoying the great outdoors. Size – Pop-ups are smaller than most RVs. That can be a very good thing when you consider having to store an RV. This is particularly true when you only use it a few times a year. With a smaller size when compacted, the pop-up is easy to put out of sight and out of mind during the non-RVing months. Tow Weight- An off-shoot of the size is the weight. With a lighter tow weight, a much wider range of vehicles can bring the pop-up along the next time you want to experience the great outdoors. In some cases, even some cars are able to tow the pop-up, meaning you don’t necessarily need a large truck to tow your pop-up to your favorite camping spot. The pop-up is a great option for anyone who loves the great outdoors, but still wants the stability and durability of an RV. If you are interested in learning more about the folding pop-up campers we have for sale at Campbell RV, you can contact us today for more information. Or, if you want to get your hands on one of our RVs and take a closer look, get driving directions to our dealership to come on by and check them out for yourself.